How To Layer Your Skincare Products In The P.M.
Live by these rules, ladies! 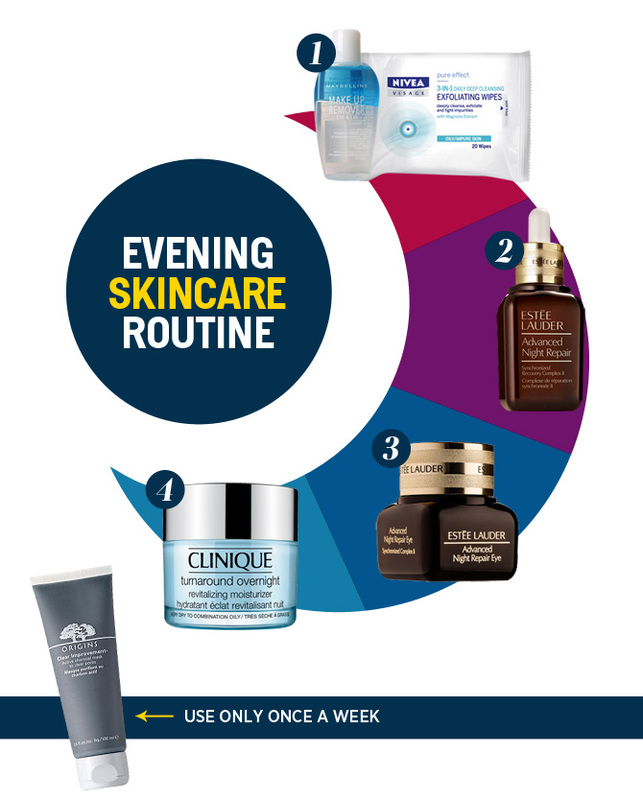 Now that you know the order of packing on products in the morning, here’s a guide on how you should do your skincare routine at night. 1) Maybelline Makeup Remover, P99, Watsons; Nivea Exfoliating Wipes, P140, Watsons; 2) Estee Lauder Advanced Night Repair P5,300, Rustans; 3) Estee Lauder Night Repair Eye P3,100; 4) Clinique Turnaround Overnight Revitalizing Moisturizer P2,900; 5) Origins Clear Improvement active charcoal mask to clear pores, P1,500, SM Makati. Using either your makeup wipes or makeup remover—or both—gently get rid of the day’s makeup. Use oil-based makeup removers in particular to remove waterproof eye makeup. Clean your face with your facial wash, followed by toner. Let your skin regenerate and repair itself by patting on a nighttime serum for your skin. Massage a few drops of the product onto your face using your fingertips. Apply a thicker eye cream to lock in moisture as you sleep. Your skin gets really dry when you hit the sheets every night, so use a richer moisturizer for your skin. That’s it! You’re ready to go to sleep. Deep clean your skin by using a clay mask at least once a week. The clay mask will tighten your pores and get rid of bacteria that can potentially lead to nasty breakouts. How To Layer Your Skincare Products In The A.M.